I can hear the sound of the engines and the smell of the racing fuel and tires. It won’t be long and we will be back racing again here in Michigan. We would again like to send out a big thank you to all our membership tracks and wish everyone racers, officials, track owners & promoters along with the fans a safe and outstanding racing season. We would like to extend a big welcome to the Butler Speedway who is once again apart of our club. The Butler Speedway was purchased by the owner of the Galesburg Speedway Ralph Warning and now will be on our 2006 Fan Club Days Event Schedule. Also there is a change in the starting date of the new Motor City Motor Sports Radio show with its new host Eddie Sachs Jr. The show is now scheduled to start on Tuesday April 25, 2006 at 7 PM to 8 PM on WSNL AM 600 in the Flint area and will be expanded in the coming weeks to cover the Metro Detroit area so tune in to see all the happens that will be going on with the new show. A VERY IMPORTANT CHANGE IN OUR APRIL MEETING LOCATION: Sorry to say that the event outing at the Motor Sports Hall of Fame of America has been cancelled due to the Novi Expo Center totally closing its doors by the end of March. Ron Watson President of the Hall sends his regrets that they were informed with the short notice to find a new location ASAP. Ron & I thought the Expo center would give all ample time to close the facility. So on Saturday April 8, 2006 at 6:00 pm the MARFC meeting will be held at the Best Western Hotel in Birch Run, MI located at 9087 E. Birch Run Road phone 989-624-9395 just east of exit 136 off I-75 at the top of the ramp. This will be our first general meeting in the Flint area in many years. Surprise guest speakers will be on hand so come on out and join us for some fun. The Michigan Automobile Racing Fan Club sends its deepest sympathies to the family, friends, and fans of racing legend Jack Bowsher. Jack passed away yesterday on April 8th, 2006 he was 75 years old. He was a true racing legend not only as a driver but as a car owner also. 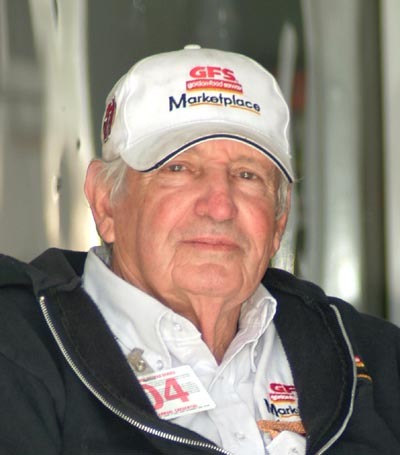 Jack was a three time ARCA National Champion driver as well as a six time Championship car owner. Our thoughts and prayers are with his family and race team at this time. He will truly be missed by all who knew him. For more information about Jack’s career go to ARCA’s website, www.arcaracing.com. We here at MARFC wish to send out a very speedy recovery to one of our clubs founders and first President Vito LoPiccolo. Vito is in our thoughts and prayers and hope to see him up and running again soon. We also send our thoughts and prayers for a get well soon to Arlene Stone wife of our Board of Directors Bill Stone. She has been battling a very long illness for sometime and could use some extra prayers. Our March meeting was held at Capers Restaurant in Mt. Clemens. It was a little different menu to hold a meeting on a Sunday afternoon but we had a good time. The first of our guest speakers was the “Preacher” Danny Slater street stock driver from the Flat Rock Speedway. Danny is a for real Minister at a Baptist Church in the down river area. He told us of how he got started into auto racing just a few short years ago and how the members of his church are his biggest fans. Terry Bogusz Jr. was on hand to tell us of how he started racing go karts and then he worked for Jomar Racing Engines before he started racing in the Super Pro Late Model Series and plans on running at Auto City Speedway along with the series again this season. It was also great to see our friend Scott Fow in attendance after his motorcycle accident in the Charlotte NC area last February. He is on the mend and sends his Thanks for all the well wishes that he has received.